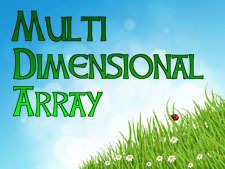 What is multi dimensional array? How to declare and initialize multi dimensional array in C#? How to use multi dimensional array in C# programming? The multi-dimensional array in C# is such type of array that contains more than one row to store data on it. 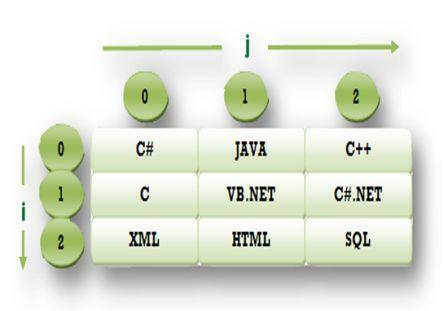 The multi-dimensional array is also known as a rectangular array in c sharp because it has the same length of each row. It can be a two-dimensional array or three-dimensional array or more. It contains more than one comma (,) within single rectangular brackets (“[ , , ,]”). To storing and accessing the elements from a multidimensional array, you need to use a nested loop in the program. The following example will help you to figure out the concept of a multidimensional array. In the preceding example, we create a two-dimensional array named Books which size is [3,3]. It means, this array has three rows and each row contains three columns. Each row can be accessed using an outer loop and each column of rows can be accessed using a nested loop inside the outer loop as follow. In this chapter you learned about multi dimensional array in C#. You also learned how to use it in c sharp programming. In next chapter you will learn about param array in C#.